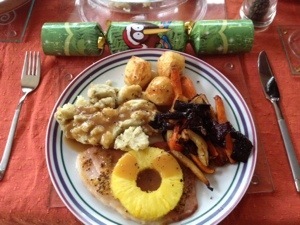 Celebrating a Summery Christmas Kiwi style! The thing that I am finding most weird is a Christmas celebration in summer. I can see its advantages, but it is still very odd indeed. 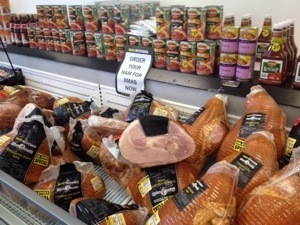 Here in New Zealand the traditional turkey is replaced to with the traditional Ham dinner. Since Mark’s work gave him a huge ham for Christmas, we decided to embrace the local tradition, and have a ham roast. Mark actually preferred it because not having to faff about with a bird, and simply slice and re-cook an already ‘ready to eat’ ham meant dinner was ready in no time! We walked for about half an hour down a beach and didn’t see a soul. We decided in the last few days to continue to tackle the garden. It’s vastly overgrown and had some care taken quite some time at. We need to reclaim the garden back and cut it all down again to a manageable size. It’s wonderful that we can use the Christmas holidays to do this. Here is the area we tackled today. Pretty much all day on the job, and the second photo was taken as the sun was setting. Almost unrecognisable! We are gradually getting our garden back! Dug up from under the roses, and these are extra to the ones that began to grow in two of the veggie beds, that we haven’t dug up yet! I also, as an added bonus, ended up with these too! I love my garden! Three vases of flowers – directly from unwanted trimmings from the garden! I could make fresh bunches of flowers all summer and you wouldn’t notice it missing! we have so many flowers! To end a perfect week, I made carrot and coriander soup, using my own coriander from my new herb garden, and we had a barbecue today, shame it couldn’t be Christmas Day, maybe next year! This entry was posted in Invercargill and tagged Christmas. Bookmark the permalink.